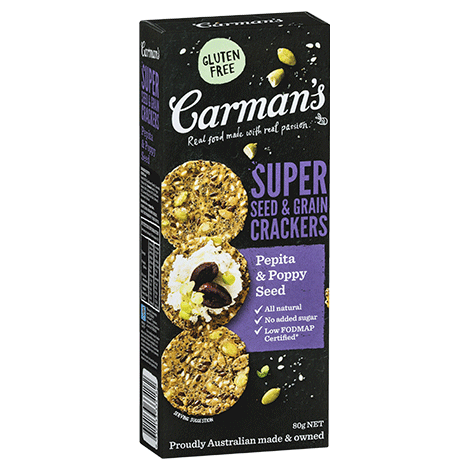 Bursting with super seeds and wholesome grains, these crunchy crackers are super tasty just as they are…or pair with your own delicious topping. Seeds 52% (Sunflower Seeds, Linseeds, Pepitas 19%, Sesame Seeds, Poppy Seeds 9%), Quinoa 25%, Sunflower Oil, Linseed Meal, Sea Salt, Natural Rosemary Extract. Monash University Low FODMAP Certified™. One serve of this product is low in FODMAPs.